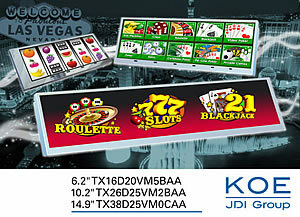 KOE is targeting leisure and entertainment applications including pay per play casino gaming machines with a range of high performance, wide aspect ratio TFT display modules. Three displays are available: 6.2" with 640 x 240 pixels, 10.2" with 800 x 256 pixels and 14.9" with 1280 x 242 pixels. The use of high performance colour TFT (thin-film transistor) displays can enable interactive gaming elements and customisation capabilities to be easily realised. The brightness, contrast and viewing angle performance of the displays are not compromised in anyway due to the use of the latest implementations of TFT technology and high brightness white LED backlights. The use of IPS (in-plane switching) wide viewing angle technology on the 14.9" display module allows the display to be used in either landscape or portrait mode which creates opportunities for new design implementations. Mark Stephenson, technical marketing manager, KOE Europe, commented, "On-site gaming machines now use advanced electronics in order to deliver high levels of entertainment and excitement. The growth of the leisure and gaming industries provide ideal opportunities for a wide-screen 'letterbox' format display to be used as a graphical user interface with a compact, narrow mechanical form factor." He continued, "KOE's IPS TFT displays provide bright, vivid colour reproduction which is an essential requirement for gaming machines used within a casino or club environment. User interface or dynamic gaming elements can be easily implemented to enhance the user experience." The 6.2" TX16D20VM5BAA display has a wide aspect ratio of 8:3 and features a cost effective UWVA (ultra-wide viewing angle) 'IPS like' display technology which enables wide viewing angles and provides a display image with excellent colour saturation, black levels and wide viewing angles. The display has a contrast ratio of 400:1 and the white LED backlight provides a brightness of 400cd/m2. The 40-pin CMOS data interface features 6-bit RGB colour data which enables a colour palette of up to 262K colours. The display module has mechanical outline dimensions of 173mm (w) x 70mm (h) x 7mm (d) and an active display area of 148.8mm (w) x 53.76mm (h). The 10.2" TX26D25VM2BAA display has a contrast ratio of 500:1 and a backlight brightness rating of 350cd/m2. The 40-pin CMOS data interface supports 6-bit RGB colour enabling a colour palette of up to 262K colours. The 10.2-inch display module has mechanical outline dimensions of 260.2mm (w) x 96.2mm (h) x 10.55mm (d) and an active display area of 246mm (w) x 78.72mm (h). The 14.9" TX38D25VM0CAA also features IPS technology which provides exceptional colour characteristics and wide viewing angles. The display has a 16:3 wide aspect ratio with an active display area of 372.48mm (w) x 70.42mm (h) and mechanical outline dimensions of 386.82mm (w) x 85.57mm (h) x 13.06mm (d). A contrast ratio of 800:1, a white LED backlight with a specified half brightness lifetime of 70K hours and a brightness of 450cd/m2 ensure excellent image performance is achieved. The 14.9-inch TFT employs a single channel 20-pin LVDS data interface and supports 6-bit RGB providing a colour palette of up to 262K colours. To aid the development and implementation of enhanced user interface designs all three display modules can be supplied with either projected capacitive (PCap) or analogue resistive touch screens. KOE is targeting a number of varied vertical markets with its TFT display solutions. Other applications include AV equipment, consumer information systems, digital signage, retail based point-of-decision displays and industrial instrumentation. The KOE 6.2", 10.2" and 14.9" wide aspect ratio TFT displays are available from Anglia Live.